Bone and antler were widely used in the Saxon period, often for jobs for which we now use plastics. Quite a lot of bone and antler objects have survived, partly because it was widely used, but also due to the fact that it generally survives well in the ground in most conditions. The Ph conditions should be ideally calcareous (chalky) or neutral. However when archaeologists are excavating in sandy acid soils, skeletal material will be very rare or in a very poor condition, or often non-existent. Horn survives very infrequently in the ground, often only being detected as a mineralised layer on metals that have rusted over time. Most of the bone used came from horses, cattle, sheep and pigs (as you might expect from an agrarian society) although bird bones were used for such things as musical pipes. Antler was sourced from red deer (called Elk in North America) or in more Northerly latitudes from the Elk (or Moose as it is called in North America) or Reindeer (or Caribou as it is known in North America). It was either taken from animals killed whilst hunting or, more usually, collected after the deer had shed their antlers naturally in February and late March. The red deer antlers as an example were used almost completely, only the tines and the brow ridge being discarded occasionally. Horn, from cows and oxen, sheep and goats, was also widely used, but, being far softer than bone or antler, does not survive quite so well in the ground. Whalebone, walrus ivory and even elephant ivory were also used as and when they became available. Bone and antler were used for a wide variety of uses such as combs, sword mounts, bracelets, pottery stamps, pins, needles, ice skates, toggles, dice, gaming pieces, spoons, weaving battens, boxes, pendants, weaving tablets, beads, needle cases, spindle whorls, planes, seals, bodkins, whistles, musical pipes, knife handles, skates, buckles, strap ends, writing tablets, axes, 'ironing boards', tuning pegs, moulds for pewter casting and even for jewellers hammers and clamps. Which is one way of saying that it performed many functions in the home and in the craft shops. One of the most striking types of bonework to survive are the various bone and bronze reliquary caskets that have survived, such as the Cammin and Bamberg caskets. These are made of exquisitely carved bone panels set into a bronze framework. Their entire surfaces were carved with mythical beasts and classic Viking patterns. One of the most useful types of bone, although not the easiest to get hold of, was whalebone. Most of this was scavenged from whales which were washed ashore, even though on occasion whales were hunted in the early medieval period. Ælfic's Colloquy does mention that hunting whales was a very dangerous occupation. This material was most useful because of its size. It could be used for making large, flat plaques probably used for 'ironing' linen, weaving swords and caskets such as the so called 'Frank's Casket'. From experience, it has been found that immature whale bone is too porous to work with, requiring adult animal bones. Horn, particularly ox and goat-horn, was also used for many of these purposes as well as drinking and musical horns. Horn has the useful property that, when placed in boiling water or roasted over a fire, it becomes soft and malleable. When in this softened state it can be moulded into other shapes, such as spoons. Horn was also used in lanterns (if it is thinned down and oiled slightly it becomes transparent), for making knife handles, and sometimes in making helmets, not with the horns sticking out from the helmet, but for flattened plates to make infill between a metal frame. Many bone items would be very cheap to make, since they utilised a material that would otherwise be thrown away and did not need the skills of a master craftsman. There are, however, some very elaborate bone objects that would have been produced by a specialist. The tools of the bone worker would have been very similar to those of the carpenter although he would also have a fine saw for cutting up the bone and antler. To clean the bone, it could be exposed for woodland insects and maggots, or buried for the worms and such to clean it, or even placed in an ants nest, especially a Wood Ants nest. In a few days they will clean off every bit of tendon and fat from the bone. Bone after all the fat and technically speaking 'gunk' has been removed, is quite a brittle material when the parts get too small. However, with practice, it can be sawn into pieces, or with a sharp axe, carefully trimmed to shape. The shavings of bone from this process are small and have few features to identify them from other rubbish produced by working the bone. After shaping with an axe, files and chisels can be used to finish of the piece, with little need to polish the surface if a really sharp chisel was used. Even the carving can be executed with the chisel. Bone can also be soaked prior to working for an hour or so to soften the surface ready for carving. Sometimes an open-work design was made by drilling right through the piece before widening or fretting out the shape. The bone and antler might be left white, but sometimes the surface was coloured or stained with a dye as was the case of a bone buckle find from York that was coloured green. Antler is stronger than bone and was used for jobs where the extra strength was needed - typically for combs where the teeth would break if made from a weaker material. Many combs are described as bone combs, where it really meant antler. Some weaving combs were replicated from the Shetlands from bone, and the teeth soon broke. There were probably specialist comb makers who carried out this complicated task. 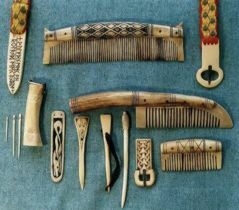 It is likely that some people would have taken their own antler to the comb-maker, thus reducing the cost of their combs which were popular items in Viking times. To make a comb the craftsman first cut off the tines or points and the burr (the swelling where the antler joined the skull) leaving just the beam (main part of the antler). Only the outside of the antler could be used as the inside is soft and spongy. If the Deer had been hunted, then the tissue inside the antler will bleed and get very sticky, however if the antler was 'scavenged' from the forest floor, then there is no such problem and the antler is 'clean'. The worker then cut some short, wide, rectangular plates to form the teeth plates and a pair of long narrow pieces as side plates to join the teeth plates together (1). Once cut the plates were sanded to shape and smoothed for the tooth plates and the side plates shaped into 'D' sections (2). The side plates were often decorated with simple designs of lines cut into the surface, which could be done at this stage or when the comb is riveted together (3). The tooth plates were then riveted between the side plates and the teeth were then cut with a saw (4). Some combs have wide set teeth at one end of the comb and much closer set fine teeth at the other. Occasionally an antler case was also made, to protect the teeth of the comb. This had two more pairs of side plates made that sandwiched the teeth of the comb. The ends of these were themselves riveted to a pair of 'tooth' plates that do not have any teeth cut into them. The case could also be decorated, and would often be tied by a leash to the comb to prevent them from becoming separated. Antler combs come in a variety of sizes from only 2½ inches (65mm) long to monsters of over a foot (30 cm) in length. For some more examples of replica Viking and Saxon bonework see Replica bonework from the Viking and Saxon period. Last updated 31 March, 2003. Article by Ben Levick, 1993; Roland Williamson 2002; Illustrations by Ben Levick.